The wondrous country of Guatemala is a one of a kind spot to explore, volunteer, and become completely immersed in its culture! RCDP International currently offers the most affordable, safe, and exciting volunteer opportunities in two amazing locations! When you volunteer in Antigua Guatemala, you get to be a part of a once in a lifetime kind of adventure! Explore the excitingly beautiful city and spend your days truly making a difference! Find your horizons broadening when you give your entire heart to a volunteer project in Xela. With every unique and spectacular moment each day brings, you'll be sure to have an experience you won't soon forget! Are you searching for an affordable and safe way to explore the colorful and culturally rich city of Antigua while also doing something charitable? RCDP Volunteer's offers amazing volunteering opportunities in Antigua, Guatemala for all different interests and passions. Antigua, the former capital of Guatemala, is a vibrant town with a fascinating history. Here you will find beautiful churches, thriving markets, coffee plantations, magnificent volcanoes, and a resilient population of friendly people. This is a tourist hot spot and a place that shouldn't be missed! During your volunteer program in Antigua, Guatemala, you will not only share your love and passion for children and community but you will also explore the city and surrounding areas. We invite you to join volunteer program in Antigua and embark on the journey of life time. Every year hundreds of volunteers arrive in Guatemala to volunteer from UK- and US-based organizations and end up paying up to $2500 to volunteer for 2 weeks. Unfortunately, only a small portion of that money actually goes to host projects and host families. The local host projects (orphanages, school, and local NGOs) in Guatemala are poor and need external support to run their programs. In our program, you will pay your fee directly to host families and projects upon arrival in Guatemala. When you join our program, we will make sure that all of your money goes to the projects and host families. Part of your fees also helps us cover our expenses. The program fee is divided into a registration fee $279 and weekly fee for room, food, coordination, and project donation. Weekly fees are divided between room plus 3 local foods a day (50%) and project donation/support of local project staffers (50%). This allocation may differ depending upon the location, project type, etc. Our coordinator will explain these issues before you pay the fee. Below is the breakdown of costs in a weekly basis. For Medical project, volunteers need to pay $25 per week an extra. The volunteering programs in Antigua, Guatemala fees will cover expenses that will begin on the first day of the program (usually the first or third Monday of the month) to the last day of the program. If you arrive before the first day of the program or you decide you stay beyond your program’s last day, you will be responsible for the additional expenses, which would typically be around $30 a day for room and meals at a hostel. Whatever you choose to stay you will always have a clean bed, bathroom, and living space. You will also receive three meals a day (breakfast, lunch and dinner) will be provided and will consist of local ingredients and feature traditional cuisine choices for Guatemala. Our meal program can accommodate vegetarian needs; however, we are not able to provide for other dietary restrictions. Food and drinks outside of mealtimes are your responsibility. In most cases, there are restaurants and markets nearby the homes in which our volunteers stay. We also offer a homestay option just 10 minutes outside of Antigua for those that are looking for a more affordable, authentic cultural experience. This home is located in lovely, quaint town of San Juan Del Obispo. Wifi is not offered at this location, but there is an available internet cafe nearby.Transportation into Antigua is very convenient with the bus stop right outside of your front door! Volunteer and Learn Spanish in Guatemala and improve your overall volunteer experience in Antigua, Guatemala! If you are interested to improve your Spanish while volunteering Antiqu, we do offer affordable Spanish language program in partnership with local Spanish school These classes are exclusive to those participating in RCDP International's a volunteering in Antigua, Guatemala program. In Antigua, We have partnered with a reputable Spanish school that employs qualified and experienced Spanish teachers and offers the most intensive and effective Spanish courses in Guatemala. We make it simple to learn Spanish in Antigua, Guatemala while you volunteer. During our Language Studies program, you can simultaneously work at their volunteer project and study Spanish. For example, you can study Spanish before lunch, and then spend the afternoon/evening involved in their volunteer activities. Alternatively, you can study in the afternoon, following their day's activities. The language school is close to most of our projects, so it is possible for volunteers to design a personal schedule. RCDP invites you to improve your Antigua, Guatemala experience by learning or improving your Spanish. During your Antigua, Guatemala volunteering experience, you will have plenty of time to experience all that Antigua has to offer, which is a lot! Antigua is a colorful, historical, and culturally rich town in Guatemala. You will find yourself on picturesque cobblestone streets passing beautiful churches, parks, and marketplaces. Outside of the city are vast coffee plantations and towering volcanoes. There are also plenty of day trips you can take from Antigua, like a trip to Lake Atitlan, the Chichicastenango Market, or some Mayan ruins. You can sign up to go volcano hiking, zip lining, or bird watching. There is something for everyone! It is worth checking out the Valhalla Experimental Station (a fascinating eco-tour) or the Chocolate Museum. Antigua has an array of outdoor, cultural, and learning experiences. During any of the Antigua, Guatemala volunteer trips, you will have the opportunity to become immersed in this unique town. There will never be a dull moment! You can click on the links below for more fascinating free time options. Our number #1 priority is the safety of our volunteers. RCDP International is a leading volunteer organization serving thousands of volunteers. We pride ourselves on providing the safest, highest quality, and most professional programs to our volunteers since 1998. Our dedicated team works closely from start to finish with each volunteer (and parents/guardians) to ensure a successful, satisfactory, and safe volunteering experience. Regardless of where you join the RCDP International volunteer program, our program starts with an in depth discussion on safety, history, cultural people, religion, life, and do’s and don’ts. Depending upon the country, these orientation programs range from a few hours to three days. During orientation, we explain the different aspect of safety and general guidelines to help keep yourself safe while volunteering abroad. 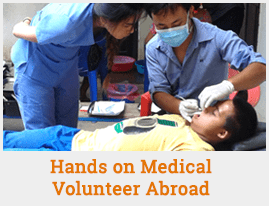 While volunteering abroad, you will be covered by international insurance. This protects you in case something unforeseen happens. It is mandatory that all volunteers obtain a travel insurance policy when volunteering abroad. RCDP International offers one of the most comprehensive insurance packages from a third party. Our insurance policy provides excellent protection in the event that a health-related issue occurs, an accident, or other unpredictable incidences. RCDP International is happy to place you with other volunteers (depending on availability) if this is something that would make you feel safer. What is the language spoken in Guatemala? Although Spanish is the official language, it is not universally spoken among the indigenous population, nor does the elderly indigenous often speak it as a second language. Twenty-one Mayan dialects are spoken, especially in rural areas, as well two non-Mayan Amerindian dialects, Xinca, an indigenous dialect and Garifuna, an Arawakan dialect spoken on the Caribbean coast. How long can I volunteer abroad in Antigua, Guatemala? You should sign up to volunteer abroad in Antigua, Guatemala for between 2-12 weeks. In general, most countries do not allow those traveling on a tourist visa to stay longer than 12 weeks. If you are set on staying longer, contact a RCDP International representative to discuss your options. If I am under 18 years old, can I still volunteer abroad in Antigua, Guatemala? If you are under 18 years old, you can still volunteer, but you need to bring a sign waiver from your legal guardian with you. Major cities have ATM machines, although not all will accept international cards. You can withdraw cash from most international banks from ATM machines, but $2-4 USD surcharges apply for each transaction. Ensure that you have notified your home bank of your intent to travel to Antigua, Guatemala. This will provide you the necessary information and alleviate any confusion at your home bank regarding international transactions, which can result in a cautionary freeze on your account in some cases. How much money should I bring with me for my volunteer opportunity in Antigua, Guatemala? RCDP International manages food and rooms for our volunteers throughout the assignment; therefore, you will not need more money to pay for these expenses. However, if you plan to take part in activities outside of our organization or buy some souvenirs, you will need to bring extra money. On a side note, you must also remember the fee for visas, which can range from US $50-100 depending on the length of stay. There may also be an airport tax that you pay upon your departure from Guatemala. You will want to determine the amount of extra money you bring based on these factors. Carrying cash is not always safe; therefore, do not carry a large surplus of cash with you. It is advised that you carry cash in a money belt with some additional stashed in your wallet. Is there a special dress code that I should follow while volunteering in Antigua, Guatemala? Volunteers should dress conservatively when at their assignments. Jeans and a t-shirt are acceptable. No short-shorts and tank tops please. Remember to consider the regional religious beliefs of Guatemala, which may be extremely conservative and revealing clothing is unacceptable - shorts and skirts must be at least knee-length and no one should show their shoulders. What should I know about religious conduct in Guatemala? It is estimated in Guatemala that 50-60% of the population is Catholic, 40% is Protestant, and 1% follow the indigenous Mayan faith. The people of Guatemala respect different cultural backgrounds, religious beliefs and moral concepts. You may practice on your own accord. Like many other countries in the world Guatemala schools also observe three sets of holidays: school, official and traditional holidays. January: On January 15, the day of the Black Christ is celebrated in Esquipulas. February or March: Lent processions begin throughout Guatemala. March or April: Lent and Easter week processions throughout Guatemala: The largest processions occur in Antigua Guatemala on Good Friday. May: On May 2 and 3, the Day of the Cross is celebrated with colorful traditions at Lake Amatitlan near Guatemala City. On May 9, Jueves de Ascencion is celebrated with traditional music, flowers and prayers at Lake Chicabal. Please be very respectful of this tradition and do not take photographs. July: July 25 is the town fair in Antigua Guatemala, with parades, music and other festivities. On July 27, the annual Rabin Ajau beauty pageant is held in Coban, with traditional dances and ancestral music. August: On August 15, Guatemala City celebrates the day of our Lady of the Asuncion; also several other towns, like Solola, where you can see the brotherhood of the Lady of Asuncion passing through the streets of the town with their icon on their way to the church. September: September 15 is the national holiday to commemorate Guatemala's Independence from Spain in 1821; the largest holiday fair is in Quetzaltenango. October: On October 20, Guatemala celebrates the overthrow of Dictator Jorge Ubico in 1944 and the beginning of 10 years of revolution government known as the " 10 Years of spring". November: All Saints Day, celebrated on November 1, is celebrated with unique traditions throughout Guatemala; giant kites are flown in the cemeteries of Santiago Sacatepequez and Sumpango near Antigua Guatemala. Many Guatemalans feast on a traditional food known as fiambre. An unusual horse race is held in Todos Santos Cuchumatan. December: The town fair in Chichicastenango culminates on December 21 with traditional dances and music. Nativity scenes, hand-made Christmas ornaments and small procession known as "posadas" create a joyful atmosphere during December. What about tipping in Guatemala? According to TripAdvisor.com you should tip a similar amount as you would in the U.S. Hotel staffs appear particularly appreciative of good tippers, and you are likely to get especially good service in return. If bills in restaurants include the word "propina" that is the tip, i.e., it has been included. If you want to pay more, go ahead. The tipping to get a good service is a wrong attitude that twists the perception of the locals about where is the value of the service they should be delivering. So, it is not advised. NOTE: Frequently Asked Questions (FAQ) is generic information and should not be used as a definitive travel guide. Travel information and situations abroad change constantly. Participants should consult RCDP International or travel advisors to verify this information.